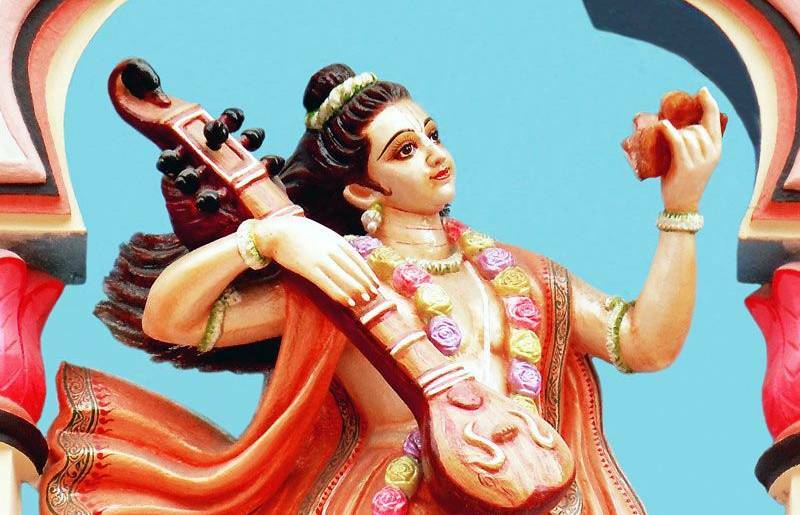 Narada is a Vedic sage, famous in Hindu traditions as a traveling musician and known for carrying all the news and enlightening wisdom. He appears in a number of Hindu texts, notably the Mahabharata and the Ramayana, as well as in most of the religious scriptures always passing on knowledge of an event or teaching the path of Bhakti to all. He has often been accused of making various people fight. Narad was the official gossip monger of those times. And while people may accuse him of causing disputes, the fact remains that his intentions were never vengeful or malicious. His ultimate goal was the betterment of every soul, living or dead, with no vested interest of his own. Without doubt he was the first journalist on the planet Earth and the heavens. And since he likes to spice up facts, he fits the role of a journalist perfectly. Vaishnav enthusiasts depict him as a pure, elevated soul who glorifies Vishnu through his devotional songs, singing the names Hari and Narayana, and he was passionate about spreading the importance of devotion and faith. According to Pauranika literature, in the creation of this universe Shri Narada Muni is the younger brother of the Four Kumaras and son of Brahma. He also rejected his father’s orders of increasing the population, and chose devotion to the Lord. He was thus present before all of the demigods. 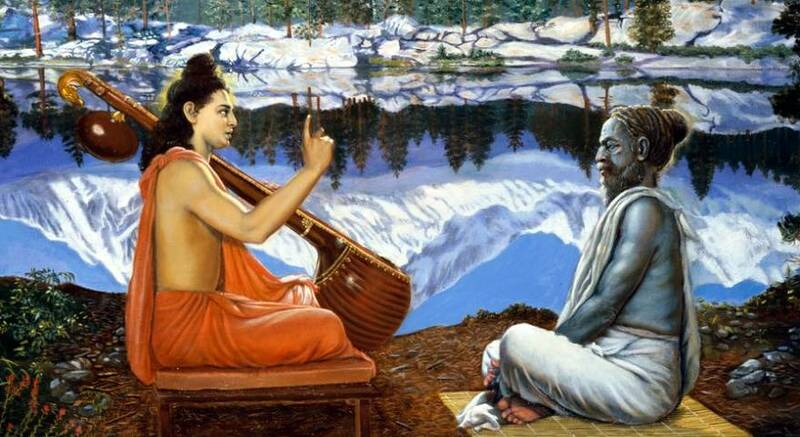 He was blessed with the ability to travel to any part of creation and he took initiation from his older brothers and their discourses are recorded in the Shri Narada Purana and other literature. He was the master of 64 Vidyas. All celestial beings worshiped him for his knowledge and there is no doubt in saying him as a mobile encyclopedia. Once he committed offences to the deva’s (demigods) in heaven, and was thus cursed to take birth as an ordinary maidservant’s son on the earth who was working near a school where Brahmanas used to learn vedic mantras. Once during the Chaturmas, the four months of rainy season, some Maha Bhagavtas, came to the school. Generally travelling monks stop at some place to spend Chaturmas. Seeing this as an opportunity his mother who was a poor servant served the Mahabhagavatas. 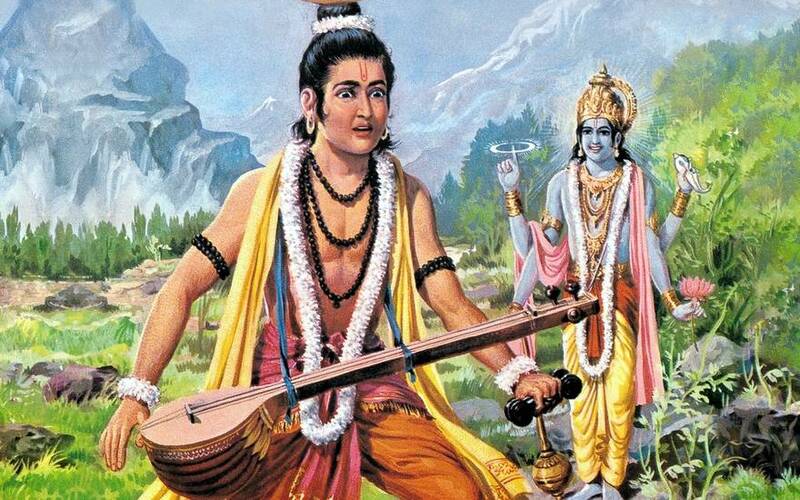 As Narada Muni was accompanying his mother , he too began to serve them. He took their permission to take their remnants of food as prasadam. He immediately began to experience changes in him as he felt himself drawn to devotion to Supreme Lord. 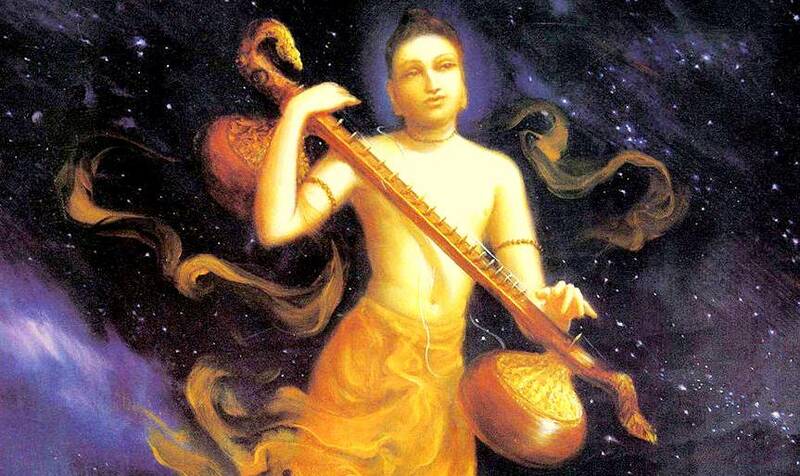 Mahabhagavatas became very pleased with Narada. 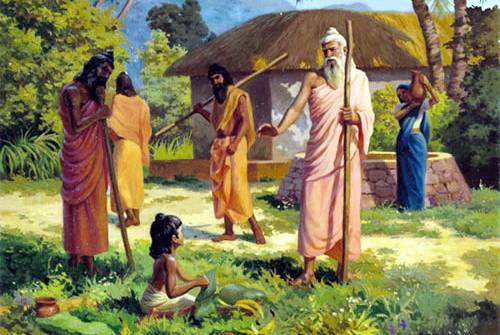 When they were about to leave they instructed Narada into the confidential knowledge of Supreme Lord. Very soon Narada became alone as his mother was bitten by a serpent. 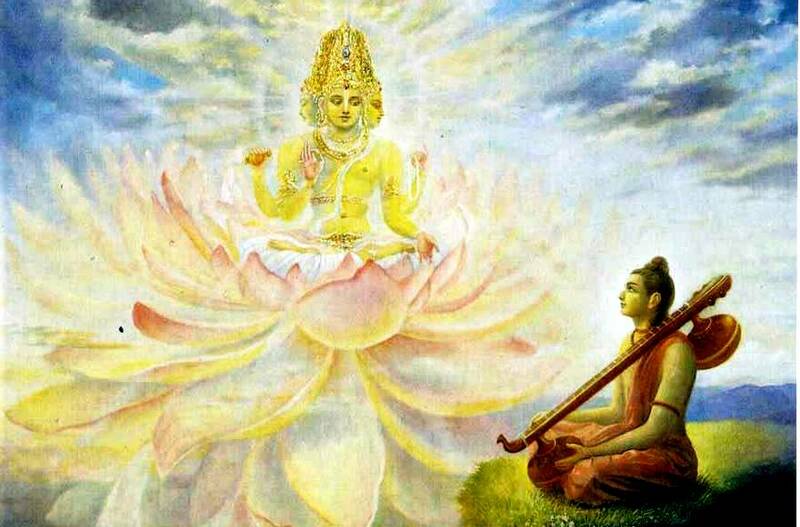 although he was only a boy of five years, he immediately took this as an opportunity to meditate on Supreme Lord. He went and sat before a banyan tree and began to meditate on the Super Soul within the heart. 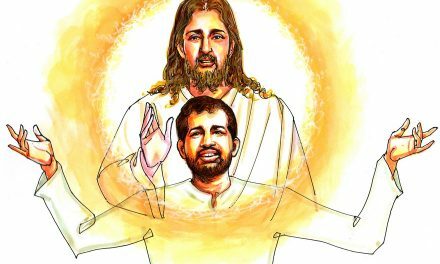 He had wonderful vision of the Supreme Lord and he became completely a spiritual person. After that by grace of Lord he could wander all places spreading the names of Narayana. 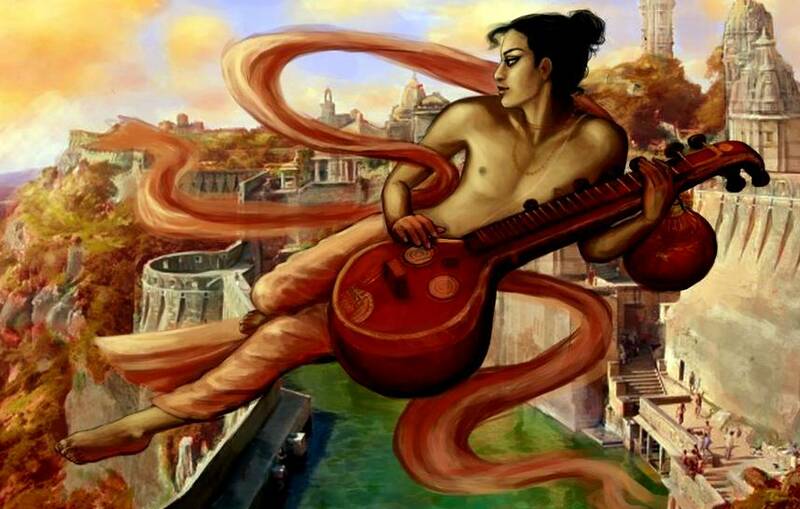 Narada is a truly global character who never required any passport to straddle Trilok. He was an institution in itself – a man of such diverse communication aptitude was not an ordinary sage, but a fierce intellectual with encyclopedic knowledge. Narad is considered as one of the 12 chiranjivis being still alive and living amongst us mortals. ‘Chiranjivi’ means one who lives forever. He is also regarded as the ‘mind’ of God – one who always knows God’s wishes. The Bhakti Sutras of Narad is one of the wonderful books on devotion and has no parallel. 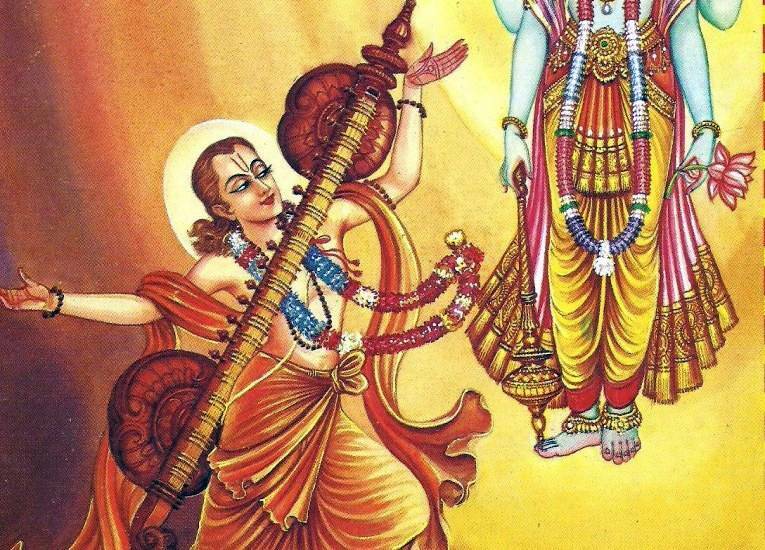 These texts outlive the philosophy and the classical authority of the concept of Bhakti. The ancient form of Sutra literature in Sanskrit is often very terse and its meaning is obscure and is liable to various interpretations. Fortunately, the Bhakti Sutras of Narad stand out their clarity, simplicity and internal coherence. The Narad Bhakti Sutra is a very ancient and authoritative scripture. He also tempted Rishi Valmiki to write the Ramayana. Only when Narad narrated the story of Lord Rama, the perfect man and the other events of Ramayana, did Valmiki agree to pen down the great epic as a poem. There is a temple dedicated to this divine sage. 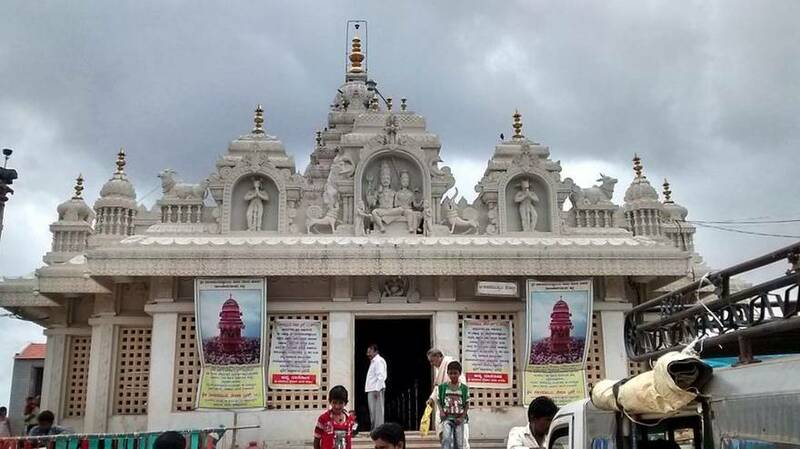 The Narada Temple is situated in Naradagadde Island of Raichur city, on the banks of Krishna River. This temple is dedicated to Narada. According to folklore, this temple is built on the site where Narada preformed penance. One who understands perfectly the process of devotional service in love of Godhead becomes intoxicated in its discharge. Sometimes he becomes stunned in ecstasy and thus enjoys his whole self, being engaged in the service of the Supreme Self.